In the high Sonoran Desert, the vistas from both We Ko Pa courses are stark and beautiful. Since the dawn of humanity and on every continent but Antarctica, bands of people have displaced others in quest of territory, food and security. As much as any of such population, Native Americans did not fare well during the European migration into the New World. Pushed into reservations in the United States, Indian tribes were typically left with land that Manifest Destiny-minded politicians felt had little value in resources, as a trade route or settlement potential. In America, the rez usually sat the middle of nowhere. That certainly described the Fort McDowell Yavapai Nation’s 40-square miles of rocky desert Arizona landscape in 1903, when it was created by executive order from Washington. However, since December of 2001, one of the most sublime golf courses anyone could imagine now wanders through the reservation, a mystical pathway of green draped on 700 acres that include natural draws, century-old saguaros and enchanting rock outcroppings. The Yavapai named it We-Ko-Pa, or Four Peaks Mountain, to honor the prominent feature in the 7000-foot-high range to the east, which includes Red Mountain and the Superstitions. It was financed by the Ft. McDowell casino and designed by Architect Scott Miller of nearby Scottsdale. Perhaps best of all, We-Ko-Pa’s remote serenity will never be broken by home-sites. 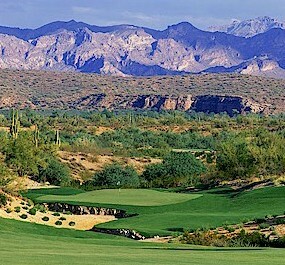 Indeed, now known as the Cholla Course, it was joined by another course built next to it called the Saguaro. Designed by Bill Coore and Ben Crenshaw, this layout also routes through the desert landscape. From many holes one can neither see nor hear a sign or sound of modern development, save for the omnipresent commercial airline controls over this part of Arizona. Tribal pride in the construction of excellent golf courses on Indian reservations is a certified and growing trend. According to the Golf Course Superintendents Association of America (GCSAA), there are roughly three-dozen Native American communities that own or operate more than 50 golf courses. It is sweet irony that such lands could be transformed into gracious and prosperous places, in a manner analogous to clever Brother Coyote of Indian mythology, who in so many tales turned a dire situation into an advantage. What’s more, well-crafted golf courses are in harmony with the transcendent reverence Native Americans have always shown their homelands. Nearly all of the tribal courses follow the stringent Audubon International standards for environmental preservation and protection, which actually enhances wildlife habitat. That concern, and a willingness to provide good architects with total support, is the formula for award-winning golf courses. 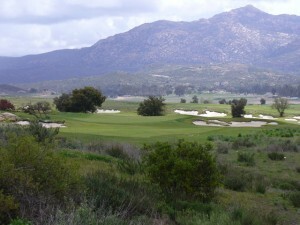 The third hole at Barona Creek. This is also true of the ancestral lands of the Mississippi Band of Choctaw Indians, which is home to the Dancing Rabbit Golf Club, with a pair of golf courses nestled among some 700 acres of ancient pines and hardwoods, gently rolling hills and two miles of spring-fed streams. Designed by Tom Fazio and PGA Tour star Jerry Pate, Dancing Rabbit opened in the late 1990s and was also ranked as one of the top 100 public courses in the nation. Last July, the Oneida Nation of New York state opened its third championship golf course, all of which are associated with the tribe’s Turning Stone Resort and Casino. Designed by the renowned Tom Fazio, the Atunyote Golf Club joined the Kaluhyat Golf Club which opened the previous year, was designed by the estimable Robert Trent Jones Jr. Turning Stone’s first course, Shenendoah Golf Club, was designed by pretty fair country architect name of Rick Smith, back in 2000. That’s one tribe, one resort and three courses designed by a veritable Hall of Fame trio of architects. While reservations may be good for golf, there are tribal leaders who feel golf is good for the reservation in several dimensions. “We are in a rural area of Eastern Oregon, which made it clear that if we were to grow, prosper and have stability, we should diversify into something more than an Indian casino,” explains Gary E. George, a Native American who is the Chief Operating Officer for the Wildhorse Resort, Casino and golf course, near Pendleton. Owned by the Confederated Tribes of the Umatilla Indian Reservation and opened in 1996, the Wildhorse course was one of the first built on reservation land. At some of the tribal courses, golfers don’t have to cut their own corners just to afford green fees. Two years ago, the Upper Skagit Indian Tribe of western Washington State purchased two highly-rated but financially-troubled courses, and put marketing muscle into reviving the operations. One of them is called Semiahmoo, a seaside facility about two hours north of Seattle. It is considered the best public course in the state. Peak-season green fees here are $69, with deep discounts in the winter. Meanwhile, Sacramento-based architect Brad Bell couldn’t wait to get started on the Cache Creek Casino Resort course in northern California. Owned and operated by the Rumsey Band of Wintun Indians, Cache Creek started out as a modest but popular bingo establishment. “They now have a huge new casino and a high end hotel, but now need that final item, a golf course, to make it a destination,” says Bell, who designed what’s become the Yocha Dehe Golf CLub, named bty Golfweek as one the best resort courses for 2011. Ah yes, that’s where reservations were usually placed, on land no one else at the time really wanted. And so it is fitting that Indian golf courses will never be lined with the condos and houses that blemish so many others. And enchantingly right and proper in the way these courses so superbly frame, feature and enhance the natural landscape of the rez.